Mstn deletion suppresses fat accumulation. (a) Increased mass of triceps muscle in Mstn–/– mice at different ages (n = 4–13). Black, Mstn+/+; blue, Mstn+/–; pink, Mstn–/–. Data are expressed as mean ± SEM. (b–f) Mass of male epididymal (b), retroperitoneal (c), and inguinal (d), and female parametrial (e) and retroperitoneal (f) fat pads at different ages (n = 4–13). Orange bars designate the mean, and symbols designate individual animals colored as in a, with diamonds for males and circles for females. #P = 0.05, *P < 0.05, **P < 0.01, ***P < 0.001, Student’s t test. 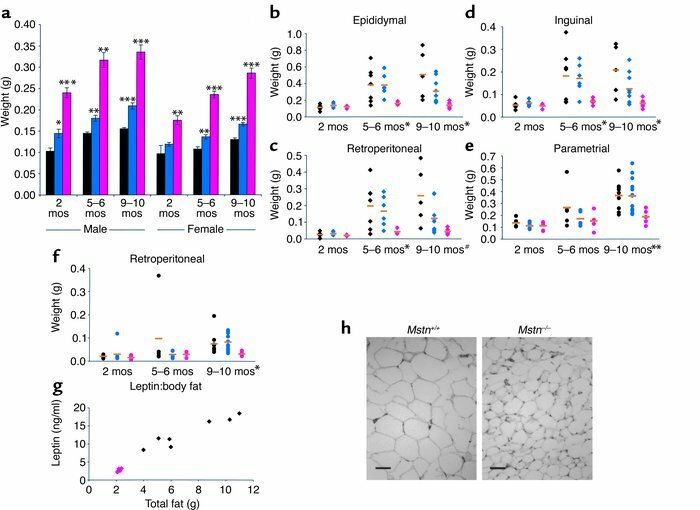 (g) Serum concentration of leptin to mass of total body fat in individual 8-month-old male mice. (h) Fat cell histology in epididymal fat pads. Scale bar = 50 μm.